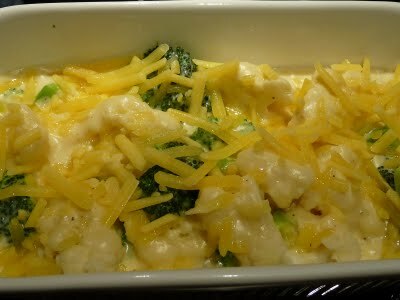 Cut brocolli and cauliflower into floreats and place in a large oven-proof dish. Make Cheese Sauce as per instructions. Pour Cheese Sauce over and around the floreats. Sprinkle grated mozerella and parmesan cheeses over top. Bake at 160°C for an hour.